Mark Holbrook, Marketing Manager with the Ohio Historical Society authors this guest post about a spooky Central Ohio tradition that has more than a few skeletons in its closet. The holidays are a time of tradition. And no Halloween tradition in Central Ohio is complete without a visit to OhioVillage for the annual All Hallow’s Eve. In fact, many families have been attending the 19th century-themed celebration since it began more than 25 years ago. Aside from the spooky happenings, All Hallow’s Eve simply offers a safe, family fun evening with lots of activities like The Amazing Maze, decorating masks, the Search for the Golden Pumpkin, pumpkin carving and more. And of course, you’ll learn a little history while you&apos;re having fun. Discover how the Jack-o-Lantern came to be, hear ghost stories from the past, listen to your fortune being told in strange ways or see the Museum of Oddities. All this adventure making you hungry? Enjoy Halloween cookies in the General Store or pick up a hot drink and hearty meals from our mobile food vendors. The evening ends with all gathered on the hillside for a dramatic telling of Washington Irving’s The Legend of Sleepy Hallow. But beware, you never know where and when the Headless Horseman might show up! 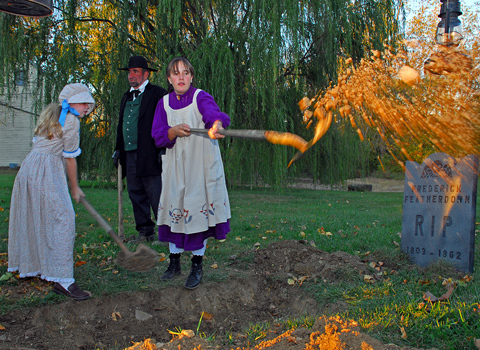 All Hallow’s Eve is this Saturday, October 22, from 5:30 – 9:30 p.m. in OhioVillage (800 E. 17th Avenue). For more information, call 614/297-2300. Admission is $12 for adults, $9 for youth (ages 6 – 12), $10 for adult OHS members and $7 for OHS youth members. Children 5 and under are free.